Achieved my best 10km finishing time here. The first time I visited Desa Parkcity a few years ago, I felt like I was in another country. Back then it was (and still is) a relatively new township within the Kepong district with a KL postcode. It did not look like your typical Malaysian township development; there are many resort-like condominiums and modern and beautiful bungalows here, all placed along streets where no one parks illegally on the sides of the streets. Public tennis courts and a well-manicured park with a Zen-like feel were also accessible to residents. It certainly was the settlement choice of many well-off locals and expatriates who decided to call Malaysia home for a little while. Given my impression of this reputable residency, I was curious to run through it. I did not sign up for Parkcity Run right away – it was only after I ran the Nike We Run KL race that I registered (I call this post-race itchy syndrome). 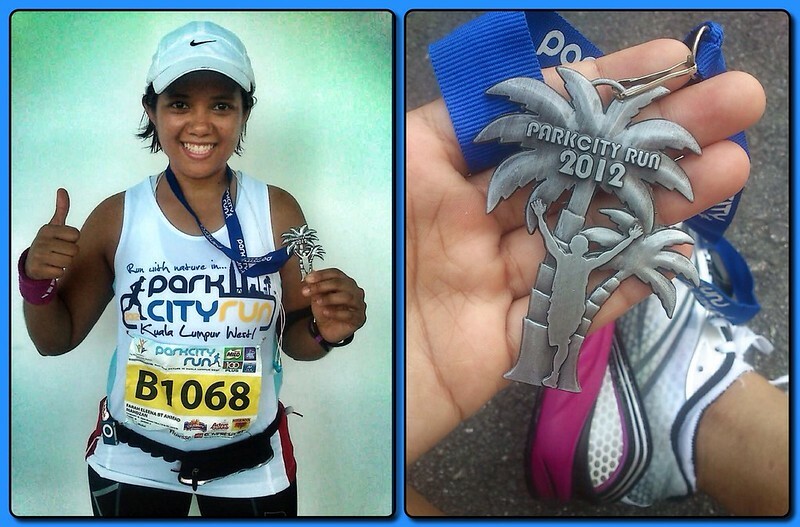 The early bird sign up period was long over, so I paid RM58 to enter, a bit pricier than other 10k runs that I’ve done. Most of my usual runner friends were preparing to run Penang Marathon, so my crowd of affiliates was absent from this run, save for two people. The race kit collection and start line venues were one and the same: the Parkcity International School. The number of participants was limited to about 3,000 collectively in various categories ranging from a 600m kids run, 2.2km for older children, to 5k and 10k for the rest of us. Flag-off for 10k was at 7.10am but curiously the 5km race was started 10 minutes earlier. When I asked the organizers why, their answer was so the 5k folks could finish first before the 10k did, thus relieving some traffic congestion. Before the 10k got flagged off, I saw a guy running from the opposite direction of the start line to join the crowd. Obviously, he wanted to be at the front without pushing his way from behind. But as the man did that, he had to run over the timing mat and since he had his timing chip on, it triggered the sensor. The organizers shouted in annoyance at his inconsiderate move because he had upset the timing system; they had to restart it. The first couple kilometers of the run was a rolling terrain, hilly but manageable. I wanted to do my best in this run so I made sure to breathe in for every 3 steps and out for every 1. Kept the pace to around high 6mins/km to low 7mins/km. Approaching km4 I knew there was a huge hill abound, and sure enough this was the “killer” hill that was pinnacle of challenges in the race. A lot of people slowed down at this point. My pace slowed too but I kept jogging, even if it meant taking tiny strides. To ease my thoughts I took in the scenery from that vantage point and it was quite breathtaking. There was no way to escape the hill unless you wanted to be disqualified – a checkpoint mat was waiting at the top. As soon as I passed the mat and the hill started going downward I let my feet run as fast as I dared, trying to make for the time spent going up it. I had 4 km left in the race, I wanted to finish within my target goal time. The sun was rising higher in the sky and it was getting hotter. I dug deep and held on to a mid-6min/km pace. I ran past a condominium where a dear friend once lived and remembered the good times we had. Passed the tennis courts and wondered when I’d get to play again. Overtook a couple of minah salleh and couldn’t believe it, I’ve always had the impression that they ran faster than me due to their longer legs. But no matter, this is MY 10km, the question was… will I make it within my target time? In the last km of the leg I increased speed, made the last U-turn and sprinted through the finish line with my heart beating out of my chest! Stopped my Garmin watch, looked at it. I think I made it within my goal time! I wasn’t so sure at that point because I had started my watch a little later after the start line. Later on when the official results came out, it was confirmed: I did a time of 1:12:59 (when I aimed for 1:12:00!). My best personal record for a 10,000m run so far and I was ecstatic. I just wanted to say a few things about the shirt and the medal they gave out for this run. There have been mixed feelings about the running vest that they gave out this year. Some people lamented about its quality. When I first took a closer at it, I noticed the cloth material is not made of the typical dri-fit material that I am accustomed to seeing in race shirts. In fact the cloth had a sack-like quality to it, except that it was softer, finer and had more thread-count. I was worried about whether I’d get badly chaffed during the run but thankfully it performed well and I ran scratch-free. I thought the design was rather nice, and the tagline of Running in Kuala Lumpur West and the KL skyline featuring the Twin Towers and KL Tower were catchy. The finisher’s medal itself garnered many praises from friends who did not run this event. They marveled at the palm tree design, and I must admit it is pretty neat. Some participants however insinuated it by calling it a weapon – and I don’t blame them, it is rather pointy and could be used as a Macgyver substitute for a Ninja Shuriken! The only drawback to it was that it did not specifically indicate whether you ran 10km or 5km, everyone who ran any category in the Parkcity Run basically gets the same medal. I’m still proud to have this medal though, it’s unique and not everyone I know has one save for one or two pals. Parkcity Run is a nice KL neighbor run that I think anyone who loves racing should do. The race was directed well, there was plenty of water at the stations, volunteers were helpful and it is a beautiful and challenging route. Since the number of runners is limited it does not get too congested which is a nice change to running bigger events. The only downfall was that the residents driving in Desa Parkcity honked a lot when they were stuck in traffic, and it was not pleasant to hear as we ran by. But alas, that is just part and parcel of running a race set in an urban area. 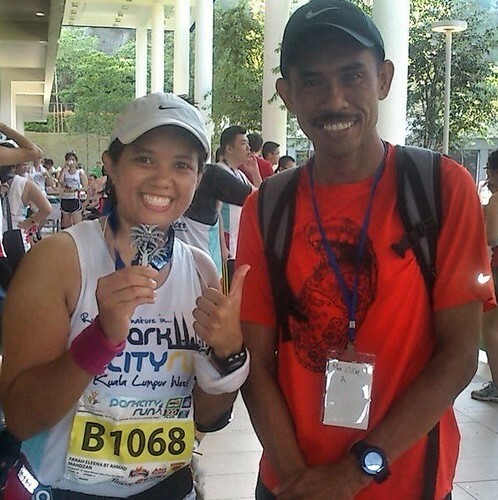 Fairy & Din Hashim, Malaysia’s current top marathoner. He placed first (of course!) in the 10k distance, with a timing of 35 minutes. Cayalah, bang!